When you want to look at the performance of a mutual fund, it's best to compare it to an index to see if they have been outperforming "buy and hold" strategies. The success of a fund often depends on this outeprformance. But what about for option traders? After all, if you're using complex option spreads then it doesn't make much sense to see how you are doing against the S&P 500. The strategies chosen are different than straight directional bets. The CBOE has put out a series of "benchmark indexes" that allow you to see how you are trading against different sets of strategies. For the past few years, I only thought that the CBOE had the "buy-write index," a strategy tracker for putting on covered calls in the S&P 500. Not only is their the "normal" BuyWrite index, but there are other options now. What if you wanted to look at how selling puts would have performed compared to covered calls? What about low-risk stock collars? The answers are now available in the data sets provided. While they are useful, these indexes are not perfect. 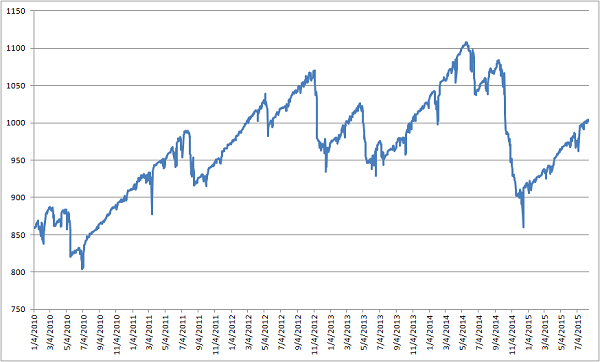 The readings given assume very systematic entries and exits without respect for what's going on in the market. For example, if the VIX is trading at the lower end of its range, it may not be the best time to add put sales to your portfolio. But I suppose any adjustment to that would require some form of market timing that you would do on your own. Iron condors are not "set and forget" trades, and you would be in a lot of trouble if you saw a 10% drop in your portfolio value like what happened at the end of 2014. My guess is that because this benchmark holds iron condors all the way to expiration, that there is a lot more risk involved compared to if the iron condor was exited earlier. If you trade multiple option strategies, it's best to track each set of strategies in it's own bucket. 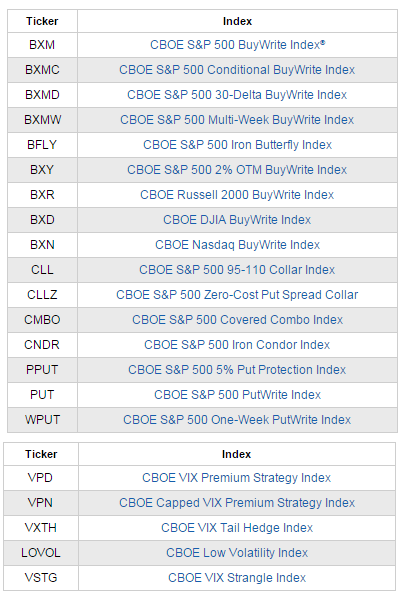 For all your iron condor trades, you should track the collective performance of those against CNDR. If you sell a lot of OTM puts, then you want to track them against PUT or perhaps BXMD. Another possibility is to use these indexes for when you want to "buy the dip" on a particular strategy. For example if you see that the iron condor index has been doing terribly over the past month, it means the market has been seeing a good amount of trending volatility. "Dip buys" in a strategy is an advanced technique but can be profitable.